There are no bad seasons, however the transitions between them can be challenging for our bodies. And coming from the harshest of seasons, winter, into the sunny and warm spring is the most challenging of them all. Winter drains our energy to a maximum, making us weak and sleepy afterwards. During winter we must preserve al the warmth we can get, wear a ridiculous amount of clothing, spend most of the time indoors without the sun and rush everywhere so we won’t freeze on the streets. So when winter is finally out of the way, our health is left exposed to all kinds of threats because of lack of vitamins, overdependence on warm clothes and lack of fresh air. And maybe it will be a surprise to someone, but the most damage during this transition falls on to our skin, the life shell of our body. Throughout winter we cause harm to our skin with indoor heating systems, which dry out skin up, with 100 layers of clothes that makes us sweat all the time if the temperature goes one degree up from what we’ve expected and of course with a lack of sun which gives us so much in terms of both a number of positive elements and great mood and motivation. All of that leaves our skin dry, weak and pale (not to mention that it is just not ready for the sun and can be extremely sensitive to the first rays of sunshine). Of course all of it is not our fault and year cycles bring a lot of natural elements into play. All life processes are slowed down during winter (a lot of wildlife even goes into hibernation) and human beings are no exception. The restoration processes of our skin is under duress in winter and we come out of this stressful season we need to revitalize our skin. All of these problems accumulate into poor skin conditions that can lead to serious disorders if left unchecked. Today we going to look at the most potent response measures and means to keep your skin healthy all year long. What do I need to do to keep my skin fresh and healthy? Maintaining your skin in healthy condition during this highly sensitive period is a simple and complex task at the same time. The approach we offer you consist of various products that will attribute to comprehensive protection and reinvigoration of your skin after winter. These shungite-based products contribute all of the famous shungite properties to your skin combined with different natural ingredients found in the home of shungite – the North. We have divided our skin care approach into 5 different categories: cleansing, peeling, toning, moisturizing and cream nourishing. Doing these procedures in this exact order every evening will do magic for your skin and save it from the unnecessary damage. Remember, before applying any of these items you should remove your make-up with any make-up removal that suits you best. Cleansing. After you have removed your make-up, it is best to use a water-based foaming cleanser which will provide in-depth cleaning of your pores and will battle such skin disorders as acne and comedo. It will also help to clean any residue from your make-up if any is left to prepare your skin for further procedures. For cleansing we offer such products as Shungite facial washing gel with a rejuvenating effect​, Shungite moisturizing washing gel with northern chamomile and meadowsweet or Shungite soft neutral facial washing gel for all skin types, among others. A mixture of shungite water and natural northern ingredients will nourish your skin with healthy elements and lay the foundation for future healing and restoration. Peeling. This procedure, as you may already know, does not require daily application, in fact, if you use scrubs too often it may even damage your healthy skin. It is better to use it twice a week or once if you have sensitive skin. Scrub will effectively peel dead skin off your face and keep it young and fresh as well as unclog your pores to promote skin regeneration. For this you can use Shungite soft antioxidant facial scrub with arctic cloudberry and cranberry seeds which will bring the natural energy of the North into your life. Shungite is known to bring restoration to damaged tissues and all sorts of trauma, so its regeneration properties are put to good use in the scrubs. Toning. Applying toner is a useful step for transition between first two steps and the rest of the procedures. It cleans up the residue of the cosmetics you have already used and prepares your skin for other cosmetics, balancing the pH level of your skin. This step is necessary because some cosmetic items cannot work properly at the same time so your skin needs to be prepared to accept the next step after it was treated with the previous one. It also smooths out the effects of scrubs especially if you have delicate skin. Shungite cleansing facial tonic with panthenol and arctic cloudberry will help you achieve all these effects or, if you don’t have it at the moment you can just use shungite water, which is really easy to make if you have a piece of shungite at home. Moisturizing. The hydration of the skin is one of the most important factors in this stressful period to keep it fresh and healthy. That is why it is essential that you use moisturizer in your skin care routine. Apart from that, moisturizer also serves as a sort of shield for all your previous procedures, as it barricades and preserves all of its effects and don’t let them be lost in a short time. A perfect product for that is Shungite antioxidant moisturizing facial and body spray that combines the unique shungite water properties with the array of positive nutritious element. 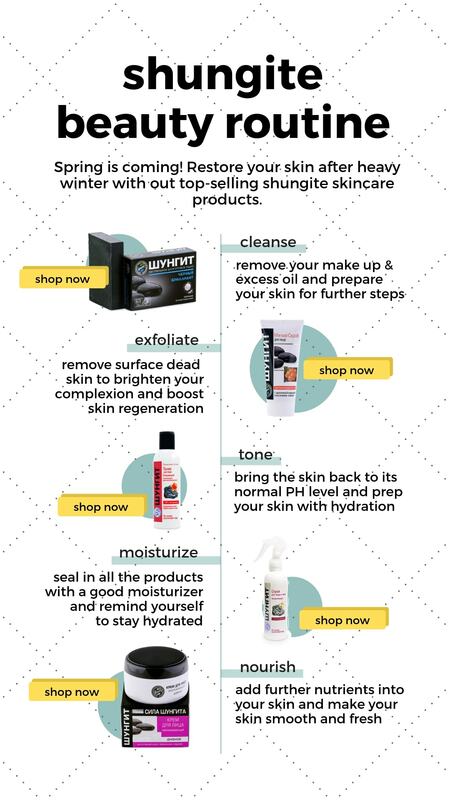 As mentioned above, hydration is the key to restoring the wintertime damages of your skin, and shungite water comes into play not only as cosmetic item, but can also influence your skin condition from the inside. Drinking shungite water nourishes your whole body and all of its systems, so that is a way to comprehensively influence your health. 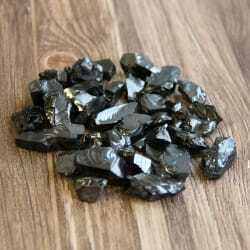 And another advantage of shungite water is that it is extremely easy to make. If you have regular shungite stones, you should use 150-200 grams (0,33 – 0,44 lbs) of stones for one liter of water (0,26 gallons). If you have elite shungite stones, you should use 50-70 grams (0,11-0,15 lbs) of stones for one liter of water. After that, you should just leave for 24-48 hours avoiding the direct sunlight and your shungite water will be ready. You can wash your face with it in the mornings or drink it regularly and it will keep your skin fresh and young for the summer. This is the approach we advise for this hard season transition period. Feel free to browse our shungite cosmetics catalogue to find all kinds of cosmetic items with different ingredients of the Northern nature with shungite. Pick your favorite shungite stones to create shungite water, which will be a powerful addition to your skin care routine. Purchase shungite cosmetics and feel happy and youthful all year long!